For students at upper-intermediate to advanced level who want to improve their knowledge and understanding of English idioms and other expressions in contemporary use. So You Think You Know English is for students at upper-intermediate to advanced level who want to improve their knowledge and understanding of English idioms and other expressions in contemporary use. The book contains fifteen units, each including up to six lively exercises for exploring and practising idioms and colloquial expressions. Five units cover contemporary idioms in general use, and ten units are linked to a particular theme, such as water, sports, people, food or business. You will learn how to use particular expressions and discover their origins. There is a key to check your answers to the exercises. Fifteen units, each including up to six lively exercises for exploring and practising idioms and colloquial expressions. 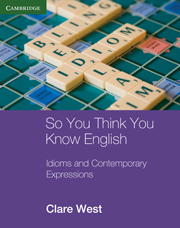 Five units cover contemporary idioms in general use, and ten units are linked to a particular theme, such as wate, food, people, sports or business. Key to check your answers to the exercises.